Hurghada is the new popular scuba diving destination of Red Sea. It is the second main diving area in Egypt after Sharm El Sheikh. It was a quiet fishing village and is now growing and growing with many hotels, resorts and dive centers. It is an ideal gateway to dive the Red Sea and is actually the main starting point for liveaboard trips to the South part of the Red Sea. It is also a popular place to learn scuba diving. 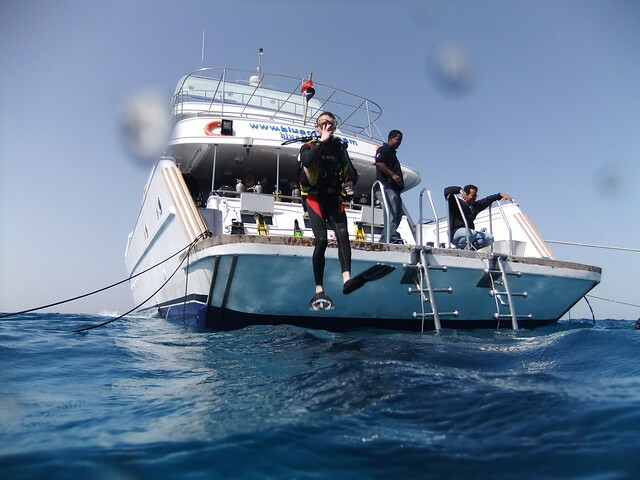 In this page you will find more detailed information about scuba diving in Hurghada. How to dive Hurghada ? 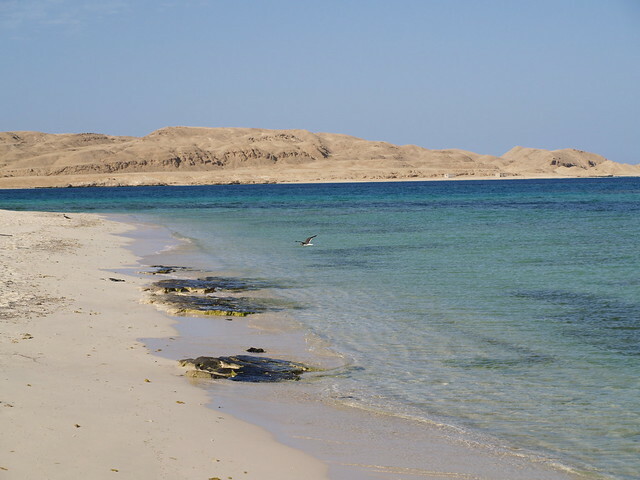 There are nice reefs around Hurghada and especially around the nearby Giftun Islands. There are also few local wrecks such as the El Mina or the Salem Express a bit more far away. These dives sites are shallow and easy with good visibility and an interesting reef life. This is the perfect spot to learn scuba diving and many Europeans come here to get their Padi Open Water Certification or CMAS 1 Star. However, for the experienced divers, the most interesting dive sites are located Northern around Abu Nuhas for superb Wreck Diving! There are four (Actually 5 but the last one is way too deep!) Wrecks on the Abu Nuhas Reef! The Wrecks (Kimon M, Giannis D, Chrisoula K and the Carnatic) are very close from each other and what is really interesting is that they come from different periods and are different kinds of ships. Moreover the wrecks are shallow with good conditions and it is possible for inexperienced divers to dive the Abu Nuhas Wrecks. The Marine Life is great with Turtles, Barracudas, Jacks, Blue Spotted Stingrays, lion fishes and all the usual reef fishes of the Red Sea! The Abu Nuhas Reef is located North of Hurghada. It is possible to dive these spots on a day trip but it will take from 2 to 3 hours each way to go there. The Rosalie Moller Wreck is a superb wreck dive! However it is quite deep, with the sea bottom at 50 meters and reserved to experienced divers. The Marine Life is amazing with lots of schooling fishes and pelagic fishes. The Rosalie Moller is located a bit more North than the Abu Nuhas Wrecks and it takes about 3 hours to go there from Hurghada. There are also other great dive sites such as the Dolphin Reef where Dolphins can often be spotted when scuba diving or when Snorkelling. A bit more South there is the superb wreck of the Salem Express but it is more easily reachable from Safaga. Scuba Diving in Hurghada is great for underwater photography because of the very good visibility and beautiful wrecks to explore. However, it is not really the best place for Macro and Critter lovers. If you look for excellent Macro and Muck Diving, try the Lembeh Strait or Wakatobi in Indonesia and Mabul Island in Malaysia! Moreover if you don’t like the crowd and if you don’t like diving with 20 other boats around you, it is maybe not the good place for you or you should consider taking a liveaboard for a few days. Most of the liveaboards going to the Southern Red Sea start from Hurghada. You can dive the excellent and famous spot of the Brothers or Elphinstone Reef! However theses destinations are reserved to experienced divers. There are also Liveaboards going to dive the Northern Red Sea and visiting the sites of Abu Nuhas, Rosalie Moller Wreck, and the world famous dive sites of the SS Thistlegorm Wreck and the Ras Mohammed Marine Park. Liveaboards are interesting if you don’t want to lose travel time to the dive sites, if you want to avoid the crowded dive sites and if you are a big fan of scuba diving. Moreover, they can be actually cheaper than Hotels+ diving day trips. I usually use this website to book in advance my hotels in Hurghada as they usually have the lowest rates I find. I like it because it's free to cancel and change the dates. It is possible to dive all year round in the Red Sea. However the air and the water temperature can vary greatly throughout the year. From July to September, it is the hottest month with a Water temperature of about 28°C. The coldest month is February with a water temperature of about 21°C. From October to November, you can expect from 25°C to 27°C. From March to June the water is warming up with temperatures ranging between 22°C to 25°C. In Winter, From November to March, you can expect temperatures ranging between 15°C and 35°C. During Summer, from April to October, air temperatures are much higher and range between 20°C to 45°C! February is the coldest month and August is the hottest one! There is no really best diving season in Red Sea but if you don’t like crowded dive sites, try to avoid the high season from March to May and from September to November! The low season and maybe the best season if you don’t care about the heat is during Summer from May to August. The Sea conditions are generally excellent in the North of Red Sea. Visibility: You can expect very good visibility all year round. It usually ranges from 20 m to 30 m depending on the dive site. At some places you can have up to 60 meters! Water Temperature: it varies a lot. The coldest month is February and you can have a chilly 21°C. December and January also have water around 22°C. From October to November and from March to June, you can expect around 26 °C. If you look for warm water, prefer a trip from June to September with an average 28°C. Current: it is generally gentle and local dive sites around Giftun Islands are perfect to learn Scuba Diving. The Red Sea offers good Snorkelling opportunities. Most of the dive centers in Urghada propose snorkelling day tours to some of the best sites around the nearby reefs and Islands. The Giftun Island is a popular Snorkelling place to observe shallow and beautiful coral gardens. When Snorkelling in the Red Sea, don’t forget your sunscreen and a T-shirt to protect from Sunburns! If you are planning an upcoming dive trip or travelling to Hurghada, it is a really good idea to invest in travel insurance for scuba diving, because you never know what could happen and when you might need it (because accidents do happen!). I recommend this diving insurance as they offer worldwide coverage and focus on providing scuba divers a quality insurance and medical assistance service. Now that you know all about the underwater world, you might want to start planning your scuba holiday! Check out our Hurghada Travel Review for information about how to get there, activities and excursions, where to stay, and more. if you go with live aboard you go from heare. We hebben op vakantie in Hurghada gesnorkeld en gedoken. We zijn onervaren met duiken, maar konden op 1 dag twee duiken maken tot 12 mtr met een ervaren instructeur. We hebben een boottocht gemaakt om snorkelend naar dolfijnen te kijken en hebben het geluk gehad om een school met 12 dolfijnen te treffen en vervolgens in het Deplhin House (gebied ten noorden van Hurghada) ruim 3 kwartier met 2 dolfijnen te “spelen”. Wat een geweldige ervaring. Zeker een aanrader. We hebben geboekt vanaf hotel Arabelle Resort waar de boot ligt die ons daar heen bracht. De 2 duiken hebben we via een “achterdeur” weten te regelen. Recently did a technical diving liveaboard Safari a tour of wrecks and sights between 60-100 metres. A whole new world I never knew existed around Hurghada and the northern Red Sea area. Went on the British owned Deep Dark safari boat which was great, it was a whole week of technical dives, even had a diver lift. Food was also top notch. Hurghada has so much to offer, most divers on,y get to see the half of it. Will definitely be returning to Hurghada! Can you recommend any day trip companies? And day trip spots? hi we are two novice diver, wanting to do liveboard, is it safe? any other recommendations? Got my Open Water course, instructor Ahmed! Very professional and fun! The most beautiful sea and best staff! I’ll definitely come back soon! Been diving a lot in Hurghada, at least 80-100 dives. Great dive spots, good visibility, many different colorful fish, good dive centers. Recomand Aquarius at Marriott Hotel. I was here in 2018, October. The Red Sea is some of the best diving i have seen ever. I have been in all bodies of water and the Red Sea in anything but RED! bring your RED filter though… you will be amazed! Diving here is EXTREMELY CHEAP!!! 2 dives, rental equipment, huge lunch on a lovely boat (more luxury than what I am used to in the US on a day dive boat), hotel drop off/pick up for $30 US. This was in May 2018. I got lucky with the dive master who made sure I was having a great time, especially since I was traveling solo. Egypt is hurting for tourists, especially in the Red Sea area, so prices are amazing. The dive spots are good to great especially with it being not far from shore. I wanted to do a live aboard for the outer reef that takes a few hours to get to but found out they have long 7-11 day trips mostly and I didn’t have the time. I saw some critters that day that I’ve never seen before so I was happy. Again, the price is fantastic! Have you been diving or snorkelling in Hurghada? Consider sharing your experience with the diving community by leaving a comment below! Looking for practical information for a trip to Hurghada? Check out our Hurghada Travel Review! Check out these few spots around Hurghada!